← Is the UK decoupling? But the underlying politics is now coming back to bite them in the bum. On Monday night Panorama screened a programme asking whether renewables are unaffordable, and whether we wouldn’t be better off cutting carbon emissions more cheaply through gas and nuclear. The programme is based on a KPMG report, out this week. It follows on from two recent reports from the right-of-centre think tank Policy Exchange (2020 Hindsight and Climate Change Policy – Time for Plan B) arguing pretty much the same. Dieter Helm from Oxford University has had this position for some time. 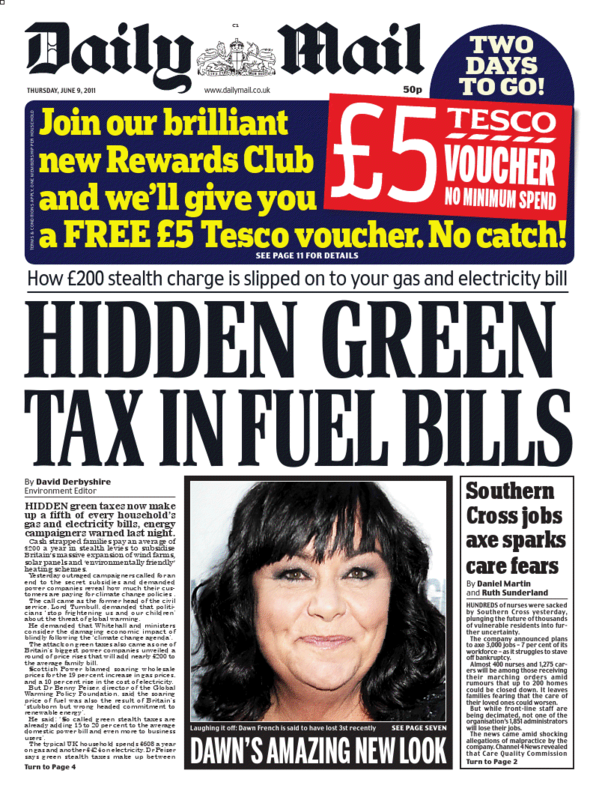 The Daily Mail and Daily Express are hammering away at the issue with a frequency that starts to alarm ministers, and the renewables programme is unpopular with the right wing of the Tory party. In September David Cameron’s two energy and climate advisors wrote a letter to him briefing him on the risks. Chris Huhne has been sufficiently concerned to mount a defence of renewable energy policy. In terms of whether the cost of offshore wind matters or not, we have the usual situation of different sides using different stats. The wind industry argues that offshore wind currently makes hardly any difference to electricity prices that are high because of the price of gas (to which might be added a not very transparent retail market). Critics of offshore wind focus attention on future costs, which could rise substantially if deployment is ambitious. The core of the argument is that the UK’s commitments under the EU’s 2020 renewable energy targets are arbitrary and expensive, and that a far cheaper way of reducing emissions to meet the UK’s 2020 emissions reductions targets under the Climate Change Act would be to build new gas fired and nuclear power stations rather than lots of offshore wind. The UK should abandon renewable energy deployment targets and mechanisms, and instead put in place a credible and stable carbon price to drive cost-effective abatement. A frequent response to these arguments I have heard in the green movement has been to say that we have to expand renewable energy because we have European 2020 targets to expand renewable energy. This is a weak defence. Citing a target is not the same thing as citing a reason for the target (and citing it as European doesn’t play well in the UK at the moment). This position seems related to the fact that some in the green movement don’t seem to get the distinction between carbon pricing and technology policy. The first of these is aimed at correcting the environmental externality – when I emit carbon emissions these have a negative effect on others but I don’t have to pay for the damage I do. The second is aimed at the idea that the private sector, left to itself, will undersupply innovation in new technologies, since any one firm can’t capture all the benefit from inventions or new business practices, even with patents (a different kind of externality). The Stern Review is good on this distinction, or there is the classic paper by Jaffe and Stavins. Renewables policy is hard to defend simply as a short-term carbon abatement policy. Most renewables are nowhere near competitive with gas, coal or petrol, even with a carbon price. Although some, like solar PV, are falling in price impressively quickly, they are still expensive. Onshore wind is one of the few which is becoming near competitive on a technology cost basis, but is made more costly and limited in scope in the UK because of the difficulty of getting planning permission. The whole idea of a renewables technology policy is that supporting innovation (both in new technologies and in better ways of making existing ones), prices will come down to the point where renewables are competitive. Thus rather than defending renewable energy targets on the basis that we have some agreed EU targets, we should be thinking about whether they are defendable as technology policies. This is where another part of the Policy Exchange critique kicks in. PEx argue that a renewable technology policy does make sense, but not the one we have. They want to scale back deployment targets, especially for more expensive renewables like offshore wind, and focus instead on more upstream interventions, like R&D credits, prizes, capital grants and government procurement programmes. In part 2 – the dilemmas posed by the backlash, whether it matters and what to do about it. Up shortly. I thought that one of the major messages of the Panorama programme was the mistake of setting the renewables target for all energy, rather than just electricity. fwiw, I recommend David MacKay’s “Sustainable Energy Without the Hot Air” (web site: http://bit.ly/p2ITil), which goes a long way to analysing the fundamental physical / chemical / engineering constraints on energy production/storage/distribution, etc. and enables a sensible discussion of the options. (eg it clearly demonstrates the relative costs/merits of solar pv vs solar heating).